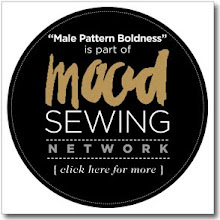 male pattern boldness: The Dickey - YEA or NAY? The Dickey - YEA or NAY? You've seen them, no doubt -- the men's version, in particular -- if only in those old movies where some kid is wearing his father's tuxedo, and the false shirt front keeps snapping up like a broken window shade (A Date With Judy comes to mind). Dickeys were popular back in the period when laundry was a hassle but formality was in fashion. It was a whole lot easier to launder, press, and starch a detachable collar or shirt front, than an entire shirt. 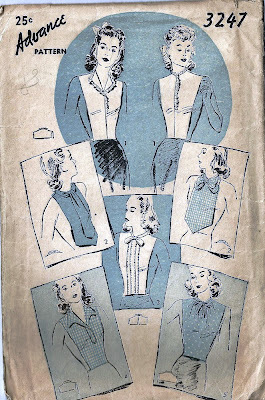 Dickey sewing (and knitting) patterns, as well as patterns for all sorts of collar-and-cuffs ensembles, proliferated back in the day, by which I mean the Nineteen-Thirties through the Sixties. Then, like so many other dainty accessories -- nylon gloves, hats with veils -- they faded away. I found this description on the Quality Time blog, and you can see the actual pattern pieces there too. I remember having a knit turtleneck dickey as a kid which served the same practical purpose as a scarf -- easy to don, easy to remove. A little research has revealed that you can still buy the old -fashioned kind here (though it looks like they're used primarily for community theater revivals of Bye Bye Birdie). Here's the most contemporary dickey pattern I could find: strictly Amish, if you ask me. 1) Clothes became cheap and styles less formal. If you wanted to look like you were wearing a frilly cotton blouse, you went out and bought a blouse. 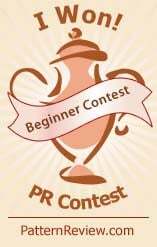 (Or you made one.) You didn't wear a dickey, which has that WWII-era Make Do and Mend feel to it, wouldn't you say? 3) Fashion is just less formal all around: dickeys are fussy (and maybe a bit prissy), and fussy doesn't cut it today. 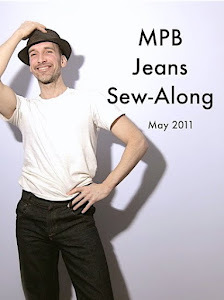 In closing, did you -- or do you now -- ever wear dickeys, or false cuffs, or any of those frilly combinations? Could you imagine sewing one? Why do you think the dickey is dead? Or is it dead -- or merely waiting in the wings, ready to make its big comeback? Personally I think what happened to the dickey was authenticity. People thought something should be what it looked like. So, if you had a white "shirt" under a jumper, then it should be a real shirt. They are a practical accessory, but I have a little bit of the "something should be what it looks like" syndrome. I won't wear a fake two piece anything. And I can only remember one fake vest attached to a blouse in my adult wardrobe ever. So, I think the problem is authenticity. That it is, my friend, that it is! My mom was a fan of the knit turtleneck ones in the 80s and early 90s. She's always hot, so wearing one under a sweater was much more do-able than the layered look. Remember slouchy sweaters with a turtleneck and matching leggings? Oh wait, that's back in again, isn't it? We wore them to Church when I was a little kid. We also wore gloves and hats. This was the early sixties. I remember how much I hated sleeping on curlers on Saturday nights after my bath. I could see wearing the turtle neck dickies if you're going out in very cold weather instead of a scarf. I've been considering making them for school. The building I work in varies so much in temperature, and I want to layer, but then my torso gets super overheated while my arms freeze. A dickey would result in a layered look, but also being made of woven material, the fabric could breathe. Win! Those dickies are definitely Mennonite, rather than Amish. I have the great misfortune to live among many of them (and their puppy mills) and that's surely something a mennonite would sport. They're too wild for an Amish person. I don't know where you live but you sure are opinionated and I feel wrongfully so. I don't understand why you feel it is a misfortune to live among the Mennonite maybe it is their misfortune to live near you. The "dickie" is not an Amish or Mennonite invention. The dickie has been around for more than a hundred years in one fashion or another used by persons of high fashion to those of us with less. It was used to cover the chest of persons that were more conservative than others or wanted to not have as much skin exposed to the chilly weather. It itself was a fashion statement. It was a detachable item which could be easily laundered. Years back your garments were not sent to the cleaners like you do today. Your garments were hung in closets that had windows; this is how my grandfather’s house was built more than a hundred years ago. The windows were a way to allow the air in and to freshen the fabrics. Generally the cuffs, collars and the hem rusching were made removable to clean since the body of the garment was generally that of wool, silk or other fabrics that were not easily laundered as today. The “turtleneck dickie” and the “camisole” inserts are a reinvention of an age old fashion application. The thing is that fashion sense, thoughts and designs of fashion, architecture, furniture and decorations go round. They get reinvented every 20 or more years, so what goes around will come around again. As soon as I saw the conversation that's where my mind went to; but Peter has no TV, so I do not know if the reference sticks. A character on the CBS show "Big Bang Theory" he wears dickeys regularly. They are not called dickies today but that is what they are - young ladies who do not want the "valley" so show all the way to the belly button wear them. I think they might be called cami inserts? Some of the young ladies wear one of their thin tee shirts (thin spaghetti strap style) backwards to get some modest height. The sold in the store variety are the rectangles with buttons or other attachments = dickies. I think in today's world the name alone is too "provocative" to be sold under the old familiar label. *sigh* I wish a few more young ladies would bend over and take a good look in the mirror then I wouldn't be standing in front of my voice class or commenting in dance classes about the deep valley issue. As someone with a larger chest that often has to make or insert a dickie into any RTW item and often into those I've made myself, even after adjusting the pattern to fit me, I agree that the name is just semantics. My family has always called them dickies and until I read this post and the responses I had no idea that people were so picky about the words and in calling them modesty panels and camisoles. I vaguely remember wearing them to schoool. I don't recall how well they worked, so maybe it was not good if I've blocked it out. I think they've been replaced by sewn-in modesty panels or camisoles, which IMHO are much easier to wear. 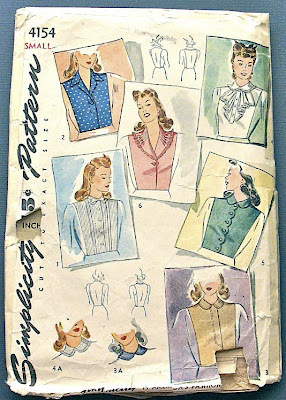 My knee-jerk reaction is "nay" to dickies, but looking at some of these vintage patterns, I'll change it to "maybe". 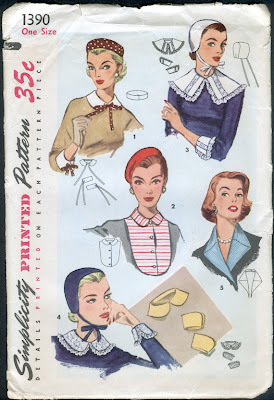 And that last Simplicity pattern - I wouldn't call it a dickie pattern, it's more of a collar/scarf. Luckily I never wore anything as egregious as those photos, but I wore collar inserts and fake turtlenecks and such in the 70s and 80s...it was an inexpensive way to extend a wardrobe and get a new look without adding bulk. Some of the fancy lace detachable collar sets were quite pretty, and I've seen examples coming back on ebay...possibly the next wave of the Peter Pan collar resurgence. Dickies have a cheesy reputation, but I can see the appeal of having the look of layers without all the bulk. I think a lot of what made dickies die out was just the change in style. I wore dickies in the early 90s, the little knit turtlenecks. I had them in every color & I hated them! You don't really see people wearing layered shirts so much anymore - at the office, yes, occasionally (and during the coldest days of winter), but it's a collared shirt under a sweater - not a turtleneck. I can't recall the last time I saw someone wearing that same style as casual fashion. It might just be my location, though - I live in the South, and our idea of "cold" is still pretty mild haha. I have fond memories of wearing knit dickies under my winter coat instead of a scarf--I associate them with snow days. I think they still kind of exist, but now they're not detachable. I see knit "2fer" tops all the time--a low-cut outer top with a different fabric insert that covers the cleavage. Or a one-piece garment that's supposed to look like a sweater set, but only has one back in it. I've only ever owned one--a sailor-ish collar that went over my middle school choir dress. It was part of the uniform and done that way because the 8th grade choir was required to buy the collar while the seventh grade choir had to buy the dress. Never really considered that a dickey, though! I saw dickies in O magazine within the last year as one of Oprah's "good things". they were v'shaped and made to look like classic button front collared shirts. Can someone explain how much savings in warmth, bulk, or comfort you would get from the ones that look like a button-front shirt but which tie at the waist? I would think that a sleeveless button-front shirt would be preferable as it wouldn't shift or make funny lines under your sweater as opposed to the tradeoff of two inches less fabric under your arms. The rest I just consider detachable collars. I still have one from the late 80s that my mother crocheted. Beautiful lace and pearls, never worn. I've worn them now and then... with mixed feelings. If they are too small and start riding up, etc. then a big thumb's down. But, I get hot so easily that wearing two layers of shirts is painful, even though the layered look can be so nice. Those "cami-secrets" are a great idea - cover the "valley" as one poster put it (too funny! I never heard of cleavage referred to that way!) without hot layers. Really, I would be thrilled if they came back and I stopped getting eyefuls of woman's chests. OY! NAY! I see dickies as close kin of clothing made from the drapes - definitely mend and make do! I guess I see them as fake clothing rather than a great accessory like a scarf or wrap. Thank you for posting our dickeys at Holidickeys.com. I love the patterns you found. Dickeys and collars are a big accessory this season. High end designers like Derek Lam and Veronica Beard are making dickeys. The prices are really high which I beleive defeats the purpose of the dickey collar. IMO, dickeys are meant to be an economical way to expand your wardrobe options and help you save time and money on maintaining a shirt or blouse. Dry Cleaning a women's blouse is 3x as much as a mens! My customers range in age from tweens with a school dress code, pregnant women looking to expand their post pregnancy wardrobe, new moms managing their cleavage, business women looking to pack light, menopausal women trying to overcome hot flashes and anyone who hates the bulk and discomfort of a blouse. Thanks again for educating everyone on dickeys! The only time I ever saw a dickey live and worn un-ironically was in 1993, when one of my elementary school classmates wore a false turtleneck with her sweater. Which was really impractical because she got warm but couldn't take her sweater off because she had no shirt underneath. The idea of dickeys seems dorky, but whenever I see vintage patterns for dresses with accompanying dickeys, they always look so sharp. Detachable cuffs and collars definitely look very cute, though I'm not sure I could pull it off. I really think the biggest factor in their decline is the overall lower standard of dressiness today. If you wore a collared shirt on the street and you weren't on your way to a desk job or a golf course, you are perceived as preppy and overdressed. Speaking of collars and preppy, who on earth started that whole popped collars on polos thing? What a disaster. Um, let's see... How do I make this polite? Oh heck NO!!!! I miss dickies about as much as I miss a bustle. I love the word "Dickey". It just sounds fun. 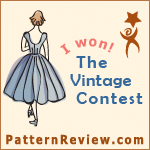 Of all the pictures of the patterns I've seen on your blog so far, these are the most fun. Oh please Mr. Dickey, don't quit your job. I'll always love you. Always and always and always..
Dickies are ok. They never hurt a soul. I had that once as a child in the late 1980s I think. And I hated it then. Similar for women. At offices for a long time wearing a buttonned shirt was mandatory, so if you thought that to uncomfortable but still had to maintain the look, you would wear that. But that's over for most professions. My vote is nay. I've been thinking about why I dislike them so much and mostly it is because of the name. It does nothing for them. It sounds neither stylish or practical. Maybe gimmicky. I think dickeys are making a small comeback - I was watching the Today show this week (or last week), and one of the guests was a young magazine editor/staffer who showed a buttondown dickey as new trendy item, and was wearing a peter pan collar dickey underneath her crew neck sweater. I personally had never heard of dickeys before I took a sewing class at FIT two years ago, and that was the first item we made. I like them in theory, to wear under sweaters and pretend you are wearing a buttondown, as I can never get buttondowns to stay tucked in/or stop looking rumpled...but I can't figure out how they stay put! 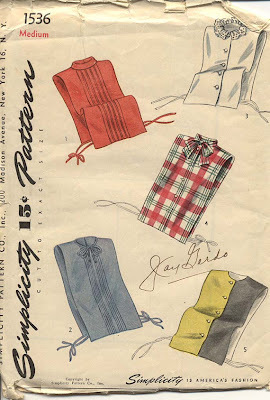 My knee-jerk reaction is to say "nay" but the more vintage dickey patterns I see, the more I think they get short shrift. I'm fussy about how clothes feel and I can't help but think they wouldn't stay in place, but those Forties ones that tie at the waist might be cool. I guess my own inclination, though, would be to wear shells under my jackets so I could take the jacket off on my long, hot, drive home. Can't do that with a dickey and not get arrested. I remember wearing a turtleneck one under a sweater. My mom used them a little bit to conceal a too open shirt. They were far more warmth and modesty panels for us than frills and accessories. I would wear them again and would sew it to make sure it didn't move about. Great for summer when you want a look but not all the layers. I wore many a dickie when I was young! Out shopping yesterday, DD went in search of a dickie to fulfill the high school's policy of collared shirts. Alas, thank you for the link - I'll make her one. How about the scene in Flashdance where the star takes off her shirt and is just wearing her dickey at dinner? Am I the only one who remembers that? I wore a fake polo neck (USTurtle) under a heavy knit Icelandic boatneck hand-me down sweater from my big sister in the sixties. Such sophistication for a nine year old! Oh the grown-uppedness! Remember Murphy Brown in the episode where she is watching her own funeral? "I always said I would never be caught dead in a dickey, now look at me, I'm dead in a dickey"
Oh my god, the dickey. What a fantastic topic for the day. A lifetime ago, I worked for a now defunct accessory store and we sold dickeys, mostly to the generations that grew up with them. Selling them was one thing, having to wear them was beyond what I was willing to do. They shifted and buckled. They were to me, tragic. Let me get this straight -- the dickey thingy goes UNDER something else, right? For the "layered look?" I think it's a great idea. I hate the way the underneath shirt always wrinkles and bunches funny under another shirt, and I'm too hot for layers. I just need some lace-edged detachable Peter Pan collars and shirtless cuffs and I'll be good to go! Scarves of all kinds have filled that same niche, haven't they? And they don't pretend to be another garment. 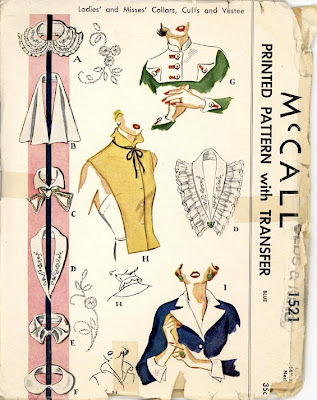 I have to say that first McCall's pattern does look pretty sharp, and theoretically they should be quite useful, but in practice I bet they're a bit of a pain to keep in place. Why they died out - well when I thought about them just now I couldn't think what I have in my wardrobe that I could wear one with, other than one cardigan. I think fashion just changed, the layered look went out, clothes got cheaper so you might as well have the whole blouse, laundry wasn't such a big deal, women stopped wearing buttoned-down shirts so much...all sorts of reasons. But I can equally see them coming back in to fashion again. I had a lot of knitted dickies with matching mitts on strings when I was a kid. Every man should have a dickey hidden away somewhere. But have you noticed in accessory stores (there's Diva, Equip and Ooh La La in my local shopping mall, but they may be Aussie only?) there are pearl collars for sale? 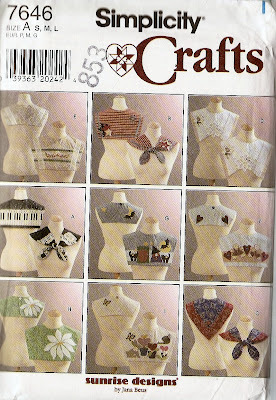 They're sort of shaped like those crocheted collars but made of woven (?) pearls (or more likely fake). Great topic. In general a big No. Not authentic, and the shifting. And you can't take off your upper layer. BUT, Some of the vintage ones could be fun. Hubster found me a pattern with those, which are growing on me. You could think of them as jewellery - decorative collars and cuffs. Maybe add to a dark knit dress, like an A-line, with long sleeves. I mean a really simple dress. This could work. But as for the button down wanna be, reminds me of crabby teachers in the 50's and 60's. Absolutely no. Just add a scarf, which really is a scarf. Cathie, in Quebec. I'd love to try out a dickey. I keep fairly stringent religious standards of modesty, and it would be nice to not have to wear a whole tank top under my shirt in the summer, when the neckline isn't high enough. Scarves don't stay in place when you bend over (and are not so flattering to the full-chested, not to mention managing to pick out one that coordinates with the scarf on my head as well). I still have turtleneck dickies from the 80s and 90s. They worked well under the big bulky sweaters of the time. Under a thinner sweater or a blouse, the line of the dickey shows through, so no fun. I made a “modesty panel” for a dress with a too-low neckline. 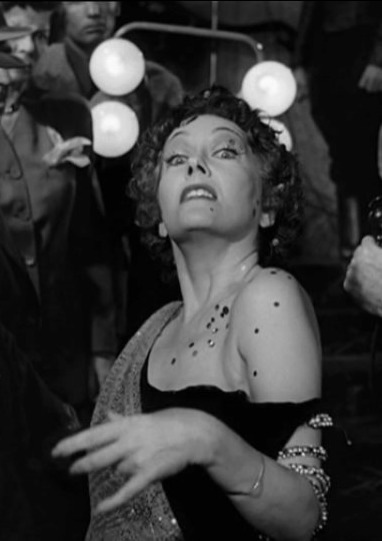 I’m not exactly The Big Valley, but for some occasions, the low neckline is inappropriate. The panel allows me to get more wear out of the dress. I am enjoying this discussion so much! We started out making dickey collars last year in festive colors/prints for the Halloween thru New Year's Holidays. Hence the name Holidickeys. Our first line was for women who had to go to a party or function and didnt want to invest in a new outfit. They could just wear their festive Holidickey with their existing outfits to add something to make it current for a Christmas, Halloween, Thanksgiving, Hanukkah or New Year's Event. Our prints were festive not literal - no Santas or Pumpkins etc. After that Collection, people started asking me to create solids and different styles - and that is how we grew. We believe that dickeys will become a staple in any women's wardrobe - like the Little Black Dress. Our collars are designed by me - an Engineer - and are guaranteed not to move or shift. Keep the discussion going - your feedback is appreciated! Haven't worn a dickie since probably the 1990's. They are convenient though. You don't have to have all those extra clothes to wash and wear. They seem to float in and out of style. Just now, they seem to be mostly out. I have some photocopies of old old dickies that are really beautiful. I know. It's hard to imagine. 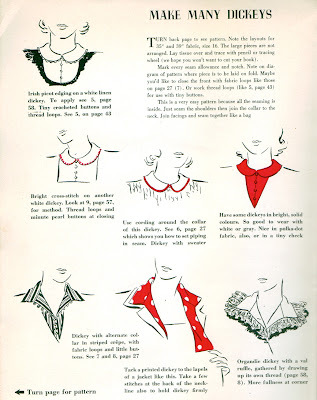 I remember the lacy peter pan collars and cuffs as somthing to wear under a light sweater, partly for style but really to keep the sweater neckline and cuffs clean. A sweater used to be a big deal and needed care. I also remember the turtleneck type under a heavy sweater. Both were handy if a little fussy. Alas, at this age, that matronly Vogue yellow wrap around the back thing that covers the upper arms would have its uses, if one could keep a straight face. I'd never heard of dickeys before Big Bang Theory and the idea is still very strange to me. So nay, partly because I can't stand having cloth next to my throat, so the sheer idea of a false turtleneck is enough to make me choke. There was a brief trend of detachable peter pan collars around here, mostly geared toward hipsters, and very short-lived. I have often wondered about the dickie. 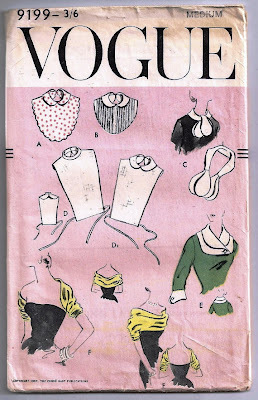 And quite fancied making one but didn't understand why one would put in so much much work when a blouse or shirt could be made without too much more effort. Was it a question of rations? Or was it simply to keep cooler underneath other layers of suits I wonder? I have one that I knitted to wear in the winter. It's a humonguous turtle neck thing and keeps me toasty warm on the coldest days. Much better than a scarf. Women don't wear fitted suits or dresses anymore, made out of washable fabrics they protected the neck bands and cuffs of the non washable garments from dirt. Plus it gave the suit or dress a whole other look stretching a woman's wardrobe.......when money was tight! That makes total sense! Thanks, James. I don't think we should lump together dickies with collar-and-cuffs; they were popular at different times and seem to serve different purposes. 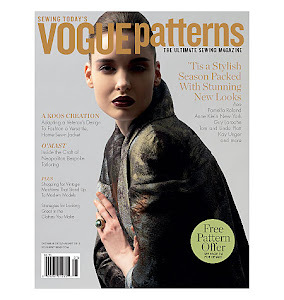 Finally, Yea, because the hat combos in pattern 1390 above are causing me great joy. ...there are things called dress shields that were were worn in the armpit of the garment to absorb the sweat...they too were washable. Second, I am amused that you asked if the dickey is dead because I see them quite a few times here in our country—and we tend to follow US trends a lot. Even more popular are detachable collars and cuffs that are worn for contrast on purpose, rather than for illusion. It's a "fashion blogger staple", especially in our country. Many of these fashion bloggers have huge readerships, eagerly lapping up what trends they wear, so to see everyone in the streets wearing the same thing wouldn't be a surprise. I'm on the fence about dickeys because with the right styling, I think they could look great. However, I'm trying to be practical on my clothing choices lately, so I'd rather skip the dickeys. i wore the beaded collars as well as dickies in the late 50s. the dickies were made specifically to fill in a v-necked sweater that was made to be filled in with a dickie. symbiotic? it was supposed to look like you were wearing different outfits when in fact no matter how many sweaters and dickies you switched out, they all looked like the same outfit. as for the beaded collars, i was so afraid to wash mine that i hardly ever wore them. i mostly had them to say i had them. Peter, after moving to MN several years ago I quickly learned how welcome the knitted dickey is for warmth I couldn't buy any so I started knitting again. It doesn't have to be plain and just serviceable. After knitting a few and getting compliments on them, low and behold they started showing up on line in the free pattern sites as Neck Warmers. I also remember the lovely collars, cuffs, scarves, etc. that we added to enhance our plain dresses and blouses. And I do not remember WWII. I believe that the general public is becoming more frugal and if you look at your heating bill a turtle neck dickey might not be such a bad addition to your wardrobe. It's amazing how much warmer you feel when wearing one. I wear a cardigan and knit cap inside nearly all winter! I had tried a couple for a year during the autumn and spring months around 1980. One was cream and the other was light tan with a cotton-lycra poloneck ( US turtleneck ) I wore over crewneck T-shirts of matching colour and under either a V-neck or crewneck knit sweater. It was comfortable enough I suppose, but I preferred to wear a whole skivvy ( US turtleneck shirt ) or lightweight ribbed poloneck instead. Which way should stripes go? What is it with gay men and women's fashion? Whatever Happened to Pattern Envelope Artwork? 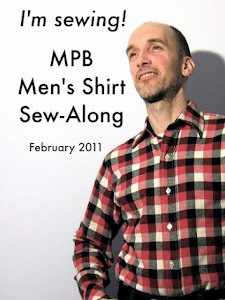 MPB Day 2012: Fashion! Fabric! Fatalities! The Robe Muslin: Who Wore It Best, Me or Mom? Vintage L.L. Bean Fashion Inspiration!